This is really spooky! “Concreted hole for a big monster. Water, dirt, darkness and a perfect echo. Enter only in fishing trousers, gumboots and with a torch. 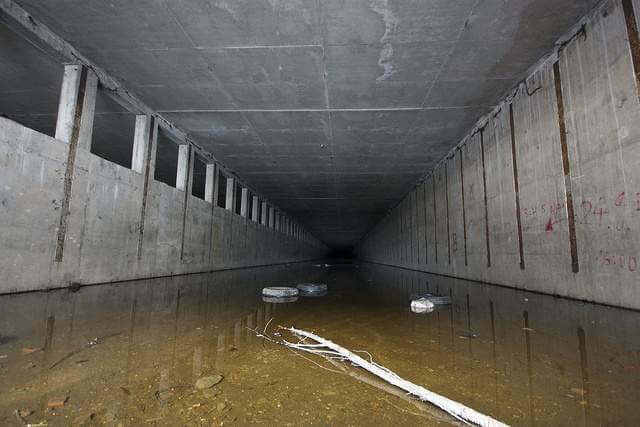 Ideal spot for shooting rap videoclips.” Really, endless tunnell filled with water and darkness creates fear and fascination for anyone who dares to get closer. This is an invitation to underground Bratislava. In 1974, when Petržalka as one of the largest socialist housing projects in Europe was blossoming, decision to create an underground transport system in Bratislava was made. Metro started to be built in 1988 by the terminus at Lúky juh area. As “metro” was allowed only for capital city and cities over 1 million according to Soviet standards, offical name of this transport system was “fast train”, something like S-Bahn. The plan was to finish the first phase until 1997. Five billion Czechoslovak crowns (Kčs) were allocated, only 400 million spent. After the fall of communist regime, in 1990 construction stopped. Project was originally built on Soviet technology and now, new possibilites from the West could be implemented. But construction never continued. The only remnant lies like a sleepy monster at the end of Petržalka district. In case of interest, we visit this place during our Post Socialist City Tour. Image provided by “happy explorer” from USA, our (hopefully) happy client.